Let Us Capture Your Special Event "LIVE" On Canvas! 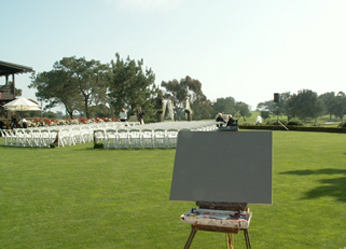 Live Event Artist provides the ultimate way to preserve your special day by capturing your celebration on canvas – during the time of the event as it takes place. Your memories will be captured on 24″x30″ canvas, in acrylic paint and presented to you that day! 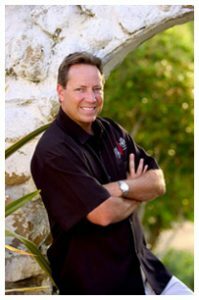 Your special event guests will love to watch as the progress unfolds and once you are presented with your painting, you will have a heirloom to cherish forever. 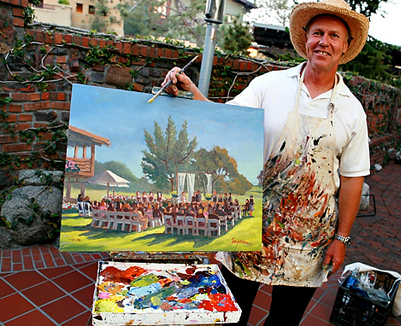 Live Event Artist thanks you for making us the number one choice for “Live Event Painting” In the United States NATIONWIDE! Featured in an article on The New York Times. Recently featured on “I Do Over” with host Diane Valentine on WE tv. See us on David Tutera’s season finale of “My Fair Wedding.” Currently featured in: Inside weddings Magazine, Southern Bride Magazine & 201 Magizine. Fill out The Live Event Artist Form, and we will get back to you with a price quote asap. Price range for paintings usually start at $2,000 & up for a keepsake that will last a lifetime. Painting size is 24 X 30. Live Event Artist is available to travel Nationwide USA. The Day Of: A Live Event Artist will arrive approximately two to three hours before the start of your event to set up the blank canvas and begin the process of capturing the feeling and flavor of your event. 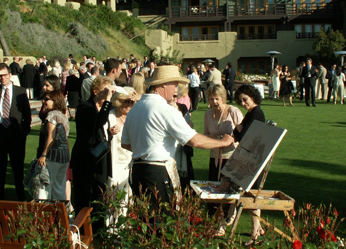 Our Artist will be working to capture the essence of your event as the moments unfold. As your celebration progresses, our Artist will be finalizing the details on the painting. We have found that guests love to take a look at the work in progress and are always facinated by how the painting evolves – it truly is a wonderful form of entertainment, as well as the perfect wedding keepsake. 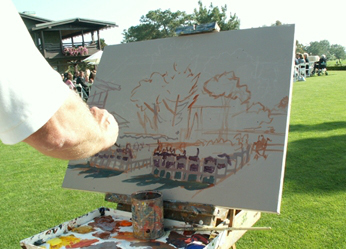 Live Event Artist will complete your painting in approximately 5 hours. The painting will be presented to the bride and groom and will be on display at the reception and ready for the bride and groom to take home that day. Many couples who are already married have asked us whether we can create a painting of their ceremony from photographs from their professional photographer and the answer is yes! “Paint from a photograph prices start at $850 plus shipping. *Sending us a photo 8 X 10 is preferred.